A two post lift differs from mobile vehicle lifts and four post lifts as it lifts from the chassis of the vehicle. Mobile column lifts lift from the wheel whereas four post lifts have drive-on platforms which are then lifted. Lifting from the chassis gives you access not only to the underside of the vehicle but also to the wheel and associated operations without the need for support stands. 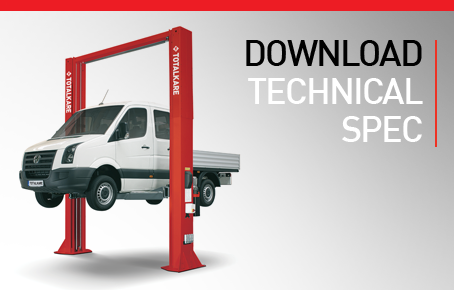 This provides a quick and effective means of lifting smaller commercial vehicles, providing more efficiency and productivity in busy light commercial garages. 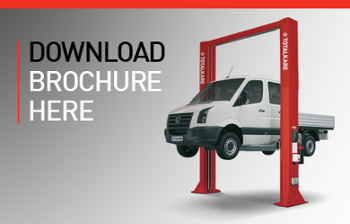 The 5,500kg capacity, base free design, electro-hydraulic two post lift from TotalKare is designed for companies with a large fleet of vans that require regular maintenance and repair work. Due to its high load bearing capacity, the two post lift from TotalKare is especially suitable for light duty commercial vehicles such as vans, minibuses and pickup trucks through to small heavy vehicles. The two post lift is specifically designed for vehicles with long wheel bases such as Mercedes-Benz Sprinter and Volkswagon Crafter vans. The two post lift is an ideal solution when a fixed post lift is needed and the flexibility of a mobile vehicle lift is not required. The telescopic arms allow the two post lift to be easily adjusted to fit a variety of vehicles and even with the lifting arms at their full extent the safe working load of 5,500kg can still be lifted. The simple drive-in action allows for quick set up for swift inspections of vehicles.